Summer didn’t seem like it would ever get here this year. And it really didn’t show up this weekend either. But today is beautiful. 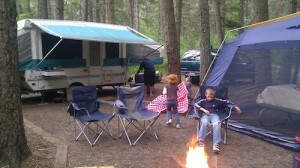 This weekend we had our first camping trip of the year. AND…. no more tents! While I loved tent camping, and until this year, always swore that you wouldn’t get me in an RV, I stand corrected. RV camping is sweet. You can see a picture of our new setup here on this post. It’s our new pop-up camper. Well, not exactly new, but new to us. We grabbed this beauty, a 1995 camper, on Friday morning, got it all tricked out and headed to Farragut State Park in Idaho. It was awesome. I don’t think I’ll tent camp unless we are backpacking or really need to. While it rained the entire weekend, the shelter of the camper and the awning provided us ample coverage to have a wonderful weekend. Next up – a rack for our canoe and mountain bikes!